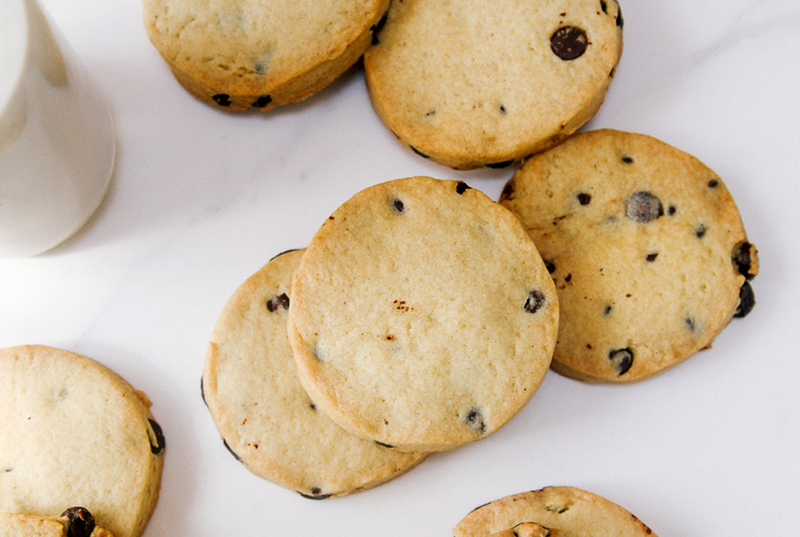 I think these chocolate chip shortbread biscuits have become my new favourite treats. Why? 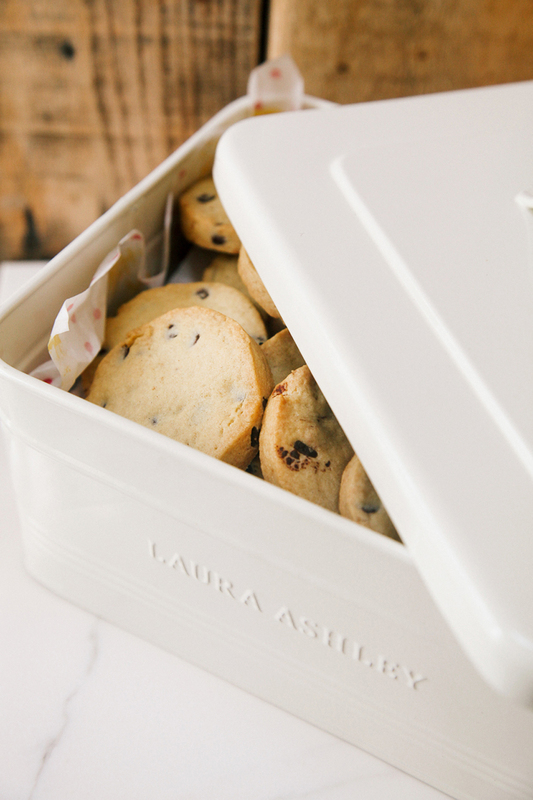 Because it’s the best of chocolate chip cookie goodness and buttery shortbread biscuit goodness in one delicious bake! There is just no way you could not love these. The trouble is, they’re a bit TOO delicious. So I would recommend only baking these if you’ve got enough people to share them with or if you’re baking them as a gift for someone. Otherwise, you will be powerless against eating them all. Which I wouldn’t recommend, as tempting as it might be. 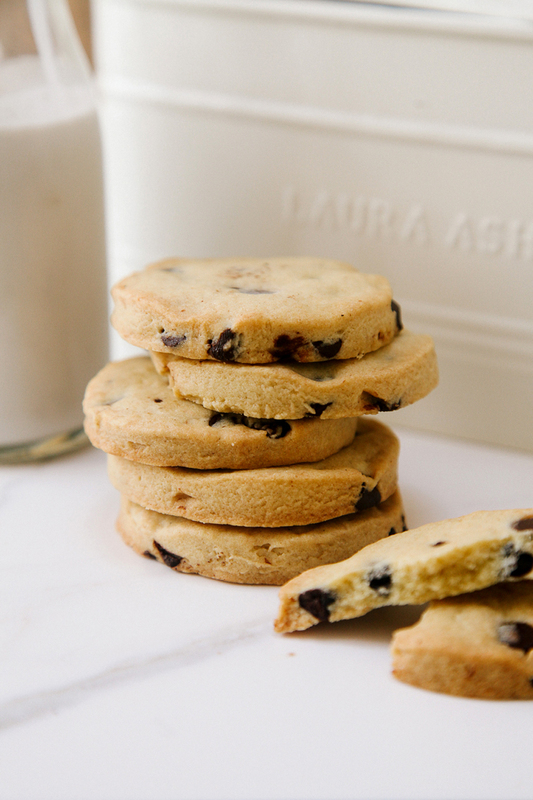 I served them in my new Laura Ashley enamel tin with some glasses of milk (I used almond milk) for the ultimate, comforting & nostalgic afternoon treat with a friend. The tin also helps keep them fresh and they should last up to a week at room temperature. 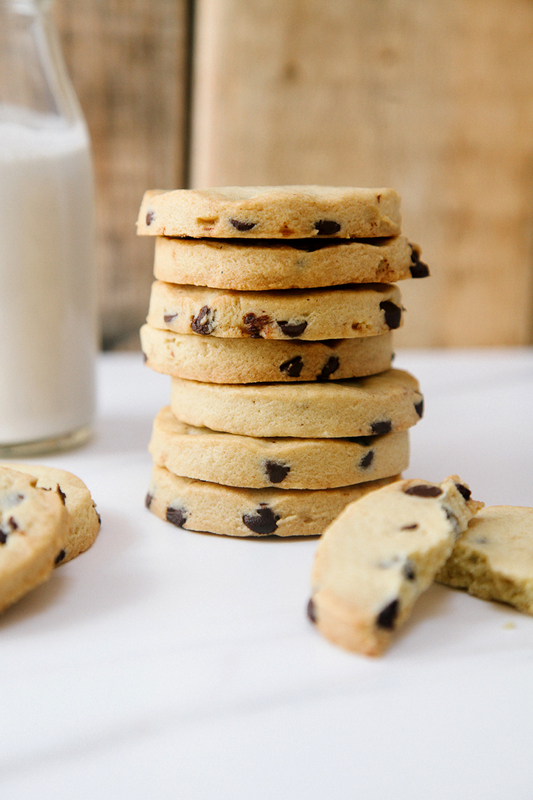 Comforting and moreish chocolate chip shortbread cookies that will melt in your mouth! Cream the butter, vanilla and sugar Stir in the flour and corn flour and mix into a dough. Once the dough is chilled, roll out to approximately ½ cm thickness and cut into shapes. Place on the baking sheet, sprinkle with a little extra sugar and bake for 12-15 minutes until golden brown at the edges, turning half way through to ensure even baking. I made them and ate like 6 in a row. So tasty. Can I use almond butter for these cookies? Can I replace the corn flour with plain flour or something else? I don’t have corn flour at home, and find it a bit too much to buy a whole package when I just need 1 tbsp.